What practical difference does believing in Christ’s resurrection make in our daily lives? In Roman 10:9-11St. Paul wrote: ‘If you declare with your mouth that Jesus is Lord, and if you believe with your heart that God raised him from the dead, then you will be saved. It is by believing with the heart that you are justified, and by making the declaration with your lips that you are saved…No one who relies on this will be brought to disgrace.’ It is hard to believe that a mangled, lifeless corpse can return to life. None of us have seen that happen, yet we are challenged not only to believe it about Jesus but to attest to it VERBALLY. What are we affirming when we say He arose from the dead? That the Father accepted His Son’s death on the cross as the sacrifice for MY sins. He didn’t require Jesus to remain in hell. Raising him was the evidence that the price paid for my sins satisfied the Father. That’s HUGE! Trivial things that annoy us don’t change our future or our hope. The body’s corrupt nature that causes us to sin sometimes will lose that power when it dies. But the life of God remains in us for eternity. That we will never be brought to disgrace. As unworthy as we are, all of Christ’s good works are credited to our account. In 2nd Corinthians 8:9 we read: ‘You are well aware of the generosity which our Lord Jesus Christ had, that, although he was rich, he became poor for your sake, so that you should become rich through his poverty.’ Why worry about our image, or popularity or finances? As a son or daughter of the Almighty God, Creator of 200 billion galaxies, we should be content no matter our circumstances. Trials make us more like Him. Rather than complain we accept them and give thanks. 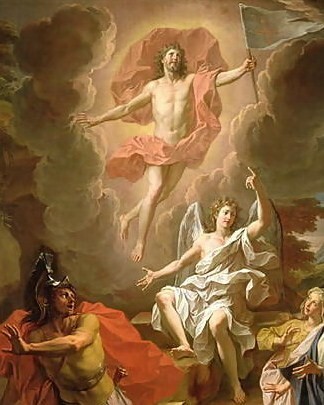 That we are part of Christ’s resurrected body – the Church. Each of us has gifts given by the Holy Spirit for service. resurrection gift? For the men in our parish, the Knights of Columbus has ample opportunity for your gifts to bless others. Previous Post What can God do in one second?